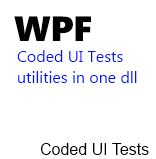 I played a lot with Coded UI Tests API on WPF applications these last weeks. It turned out that this is a really powerful framework available to use but that we need to write a lot of code ourselves even for simple things. You may already know the coded ui test utilities of Gautam Goenka available on his blog. On this blog post, I want to introduce a set of complementary helper methods that you can use in your project. The links to the binaries/sources are at the end of the post. List, Tree and Menu emptiness tests as User extension methods. Helper to get all the AutomationIds of a control collection. Helper to get all the children control of a specific type. Easier set text syntax with fallback method: youpi ! Easier expand and collapse syntax. It’s always useful to know if a listbox is empty or not. Now you can use these simple methods. Sometimes you store information trough AutomationIds. This method will help you to retrive them in a simple way. This is a recursive method which can helps you in several scenarii. Be sure to notice that there is an override which takes a boolean as a parameter. If it sets to false, the method will return ALL the children and not only the direct one. Also, be sure to understand that you won’t be able to call the Find method on these controls as they do not have defined search properties. I found out trying to set the text of a TextBox that you can end up waiting eternity for the text being really set. I do so tried to create an helper method which can be faster using the automation pattern. I then try to use the value pattern but oddly, it wasn’t available on the TextBox automation peer. I finally find on a MSDN code sample comments that “Elements that support TextPattern do not support ValuePattern and TextPattern does not support setting the text of multi-line edit or document controls”. So if the control implements the TextPattern, you have to use a fallback method which is in fact simulate keyboard inputs. Testing if a control implements a pattern and then trying to call it represents a lot of code line. With this helper you just have one single line method call. Same as the previous, one single line to collapse/expand a control. If the control does not implements the pattern, the method will just returns false. Select a control in one line of code ! Instead of simulate a mouse click, you can now use this method which will use the invoke pattern even if the control is hided. Were are the binaries ? Don’t forget to support me by registering to Dropbox using this link. » The Techdays 2012 are coming !